The Adventure Park of Peccioli is an unique building in his category, because it appear in the garden of Caffè Haus, a suggestive complex date back to XVII century; the garden is surrounded by a scenic loggia, it is located in the historical center, it is in front of fantastic view of Valdera’s hills. MINI ROUTE :For the little ones (from three to seven years) for do the same things as an adult but in totally security. JUNIOR ROUTE : If you want to try the demanding route (Minimum required height 110 cm). URBAN WILD ROUTE :If you want to taste harder emotions suspended in Tuscan country 70 meters lower (Minimum required height 110 cm). We advise you to call us if the weather is uncertain! 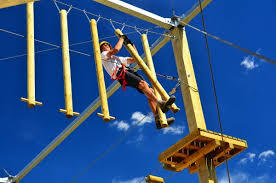 The entrance of the adventure park of “PeccioloAvventura“ is free. The MINI Route is free. If you show your identity card.